Creating highly immersive attractions and experiences that transport guests to a world of fantasy begins with storytelling, Morosky said, which is interwoven into every facet of the experience, including the outdoor environments. With projects taking five or more years to complete, he and his team are involved with every phase of development, from helping create the initial storyline and concepts to overseeing construction. Morosky’s own story began in Erie, Pennsylvania, where he learned about the field of landscape architecture while working for a local landscape company during summer breaks. The ability to combine his passion for the outdoors with his interest in drawing appealed to him. After visiting The Ohio State University and meeting Jot Carpenter, the passionate head of its landscape architecture program at the time, Morosky knew the setting of his next chapter. “You never know when you start someplace where you’re going to end up and I’m really grateful for the beginning that I had here at Ohio State and am honored to represent the university in what I do on a daily basis,” he shared. Morosky’s Buckeye pride is a resounding theme of his story. In 2015, Ohio State’s Landscape Architecture program celebrated its 100th anniversary. Morosky also had reason to celebrate that year, as he received the college’s Distinguished Alumnus Award in recognition of his professional achievements. Recently Morosky took the time to share what goes in to making Disney magic, the importance of sustainability to the Walt Disney Company, the unique aspects of practicing landscape architecture at Disney and how his Ohio State education helped prepare him for success. What attracted you to the landscape architecture field? When did you know you wanted to become a landscape architect? I always enjoyed being outdoors growing up and found an excuse to be outside year round. I had a small ability to sketch and learned architectural drafting in high school. Summers I worked at a local landscape company and learned about horticulture and landscape construction, which was really exciting to me. At the time I never heard of a Landscape Architect until I was informed of it by the owner of the landscape company. Seemed like an interesting combination of the outdoors and drawing, two things that were of interest, so the rest is history. My father took me to visit the Ohio State campus the summer before classes were to start. There I met Jot Carpenter, Head of the Landscape Architecture Department at the time. He was so enthusiastic, maniacal almost, about the profession and how the program would provide me a great education, so I signed on. As it turned out, Ohio State became the number one Landscape Architecture program in the country under Jot. Did you feel well-prepared for your career after graduation? I was fortunate to attend Ohio State and be educated by a really diversely talented faculty. Each had his or her unique skill set of knowledge to offer the students. Professor Steven Drown was particularly important in my development as a student and mentored me as his teaching assistant as well. Upon graduating, I found that I had many applicable skills that enabled me to be productive immediately in my first job. The skills I first developed at Ohio State have been refined and expanded over the years, but are still ones that I apply every day. I learned a process of how to solve problems of varying scales and difficulties and that there is more than one solution to every problem and be willing to explore the options. What role does landscape architecture play at Disney theme parks and resorts? Landscape architecture plays a defining role within the Disney theme park and resort environments. One of the many distinguishing attributes of Disney parks and resorts is the quality of our outdoor environments or “Area Development” as it is known within Imagineering. Area Development design begins with the particular story being told. It is essential to create an environment that is evocative of the time and place where the story takes place. This could be Main Street at Disneyland, the fantasy world of Pandora, or Aulani, a Disney Resort and Spa in Hawaii. Depending on the project, our Landscape Architects work in close collaboration with many of Walt Disney Imagineering’s 140-plus professional designers, engineers, artists, writers, operations experts, entertainers and/or scientists to develop design ideas and concepts for the parks and resorts. Once the project storyline and concepts are agreed upon, the Landscape Architecture team will develop site specific design ideas for the Area Development to be flushed out with the larger team ultimately identifying the most feasible design based upon creative intent, functionality, sustainability and value. With that direction, we further develop the design intent into a series of artistic and technical documents utilized for project construction. Typically, a Disney theme park project can take five or more years to design and bring to fruition given the complexity of our projects. During this time, our Landscape Architects play a key role in the design and oversight of the Area Development construction to ensure the design intent and Disney quality is captured during all phases of a project through opening day. Tell us about your role at Disney Imagineering, your team and what goes into designing immersive landscapes? I wear several hats at Imagineering on behalf of the Landscape Architectural Studio. As the Landscape Architecture Studio Executive, my responsibilities include the casting of talent on various projects to best align a set of skills and knowledge with that of the project needs. Talent acquisition and development are part of that role as well. Organizationally, we are constantly evolving our talents and skill sets to adapt to our changing world, so it is imperative that our team is constantly developing new skills and talents with practice standards, digital tools or new collaborations with design and project delivery partnerships. I am also involved in the collaborative Master Planning efforts of our properties globally. Once projects move past the planning stage, often my role shifts to that of a Conceptual Landscape Architect developing initial design concepts with our project teams. The development of a truly convincing immersive environment is a highly challenging effort. This goes back to my earlier comment that all of our most successful placemaking, meaning our guests feel transported to a unique time and place, is a result of the story being told. Our ability, as Landscape Architects, to design and build the environmental part of the story all hinges upon our ability to execute key components of the Area Development. We must arrange clear spatial definition blocking the outside world, create the appropriate scale, select the essential landscape materials and finishes, and create guest comfort. All of this needs to get done in a holistic, balanced and integrated fashion with entertainment, architecture, engineering and operational attributes of the park or resort environment, and tell that story in a convincing way for the guest. In other words: make Disney magic! How important is sustainability, conservation and energy consumption in your team’s designs? Both at Imagineering, and at the Walt Disney Company overall, we seek to achieve a positive environmental impact. Therefore, we always think about ways to conserve water and energy and ecosystems while encouraging environmentally responsive behavior. We seek to select plant materials that are native or indigenous to the local ecosystem reducing irrigation water use for our landscapes, source material locally and utilize recycled materials where possible. Are there differences in practicing landscape architecture at Disney versus other companies/firms? A unique aspect to our Landscape Architectural practice at Imagineering is definitely that of storytelling. Every environment that we design and develop is based upon creating a great experience for our guests and the opportunity for immersion with the story and interaction with the guest. This goes all the way back to the creation of Disneyland and Walt Disney’s desire to immerse the guest into the various stories being told within Disneyland. There is a plaque over the entryway into Disneyland that reads, “Here you leave today and enter the world of yesterday, tomorrow and fantasy.” This is still true of our goals in 2018 and beyond. Our Imagineering Landscape Architectural Studio, being part of the Walt Disney Company, offers us a broad and informative perspective of our work. As the designers, builders and operators of Disney Parks globally, we are able to learn many lessons from our parks and resorts development and operations. With the sun never setting on a Disney theme park or resort and millions of guests visiting, we gain the benefit of understanding what works and what does not. Having a multi-cultural audience ranging from two to 92 attend our parks, there is much we learn everyday about the ever-evolving operations of the parks. This provides insights into the guest experience offering us the ability to improve upon our design and delivery of those experiences. 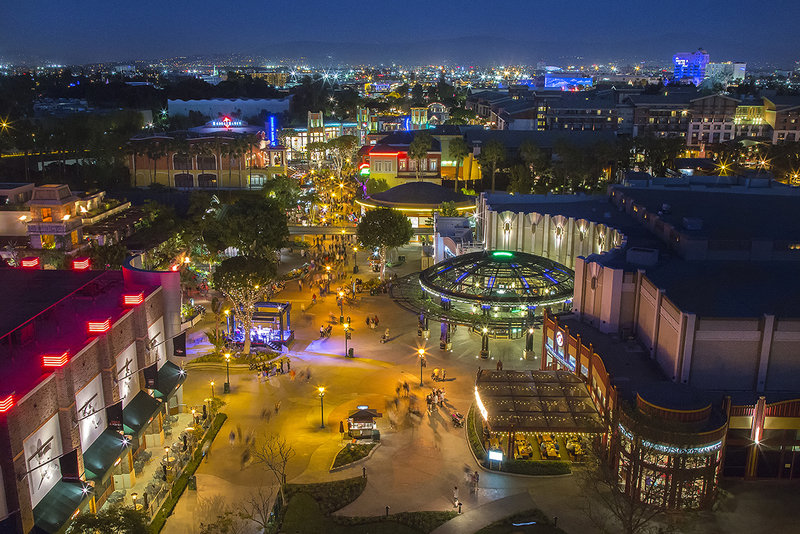 Downtown Disney is an outdoor shopping, dining and entertainment venue at the Disneyland Resort in Anaheim, California. [Photo courtesy of Walt Disney Imagineering]Having highly diverse geographic locations of Disney parks and resorts, including Southern California, Central Florida, Tokyo, Paris, Hong Kong, Hawaii and Shanghai, offers our Landscape Architects the opportunity to study and become knowledgeable of the cultural landscapes of each of these places. We have integrated partnerships with our Imagineers in each of these locations enabling us to understand the nuances and uniqueness of each environment so we can build globally and locally at the same time. Every project here at Imagineering presents itself as a unique opportunity to contribute to the Disney legacy of creating wonderful places for people to engage and enjoy themselves. I have been fortunate to contribute to many great projects, it’s tough to name them all here, so that’s another conversation. I would say that being part of the on-going growth and development of our Landscape Architectural Studio talent and watching our capabilities grow over the years has been very rewarding. What do you find most rewarding/challenging about your work? The challenges … how do we keep up with changing guest needs, integrate the latest design technology in our practice, develop emerging talent, become more effective in our project delivery, the speed of change in today’s world, all good ones. As someone responsible for creating Disney magic for 21+ years, how do you sustain your inspiration and creativity? 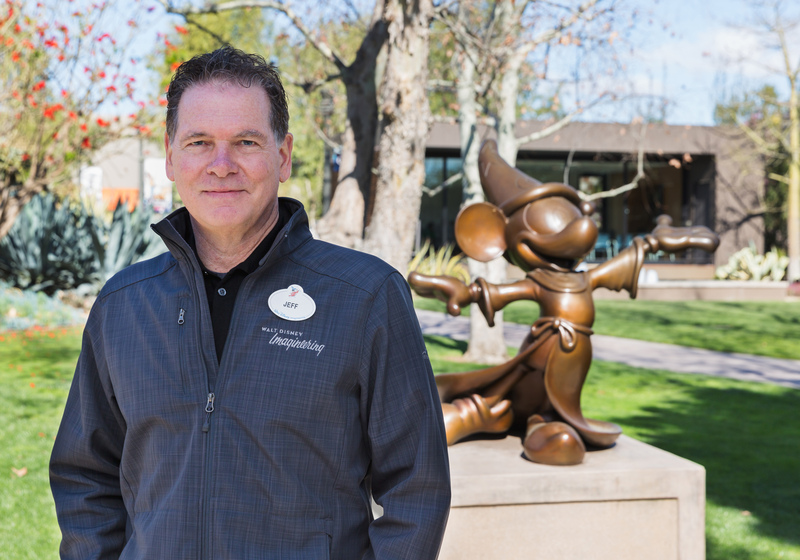 I work in a dynamic culture with amazingly talented people every day that really embody the Disney spirit to deliver inspirational guest experiences and carry on a legacy of great storytelling and creation of Disney placemaking. My teammates inspire me each day.